Michael Franti’s eighth studio album, The Sound of Sunshine, is set to drop on August 24th via his new-old record label – Capitol. It will be following in the foot steps of 2008’s All Rebel Rockers, which peaked at no. 37 on Billboard’s Top 200 and is his most commercially successful record to date. Most of the new album was recorded during Franti’s opening gig on John Mayer’s winter tour using a portable recording rig, and the band, Spearhead, used its live sets to road test and tweak songs before recording them in arenas, hotels, and locker rooms around the country. "Every day we'd play the songs and then go back into the dressing room and go, 'Y'know, the chorus needs a different chord change' or 'The audience wasn't dancing to it as much'", Franti told Billboard.com, “We would record the drums and guitars right there and I'd take the rig into my hotel room at night and record the vocals all night long.” By the sound of the results, the 44-year-old is trying his best to do good by his new bosses. The nearly four-minute title track is the album’s second single, and will probably land on Top 40 radio. The intro sounds eerily like Jason Mraz’s “I’m Yours” and the rest of the song track a strummy pop tune that is full of harmonies and bouncy acoustic guitars. 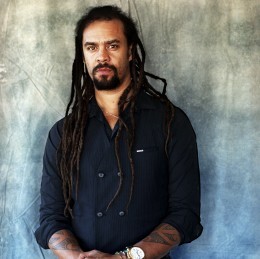 Franti has admitted wanting to get away from a the strictly reggae vibe on All Rebel Rockers and used the acoustic guitar to write most of The Sound of Sunshine.